"Asteroids are more subtle than we imagined," says Dr Erik Asphaug, of the University of California, US, commenting on the data sent back by the Near-Shoemaker spacecraft as it touched down on asteroid Eros last February. The survey and landing carried out by the Near Earth Asteroid Rendezvous (Near)-Shoemaker probe revealed Eros to be a tiny irregularly shaped world strewn with boulders, pitted with rocks, and, surprisingly, strange "mobile" soils. Eros is over four billion years old, a leftover from the formation of the planets, and has never been part of a much larger body. It bears the scars of numerous impacts but its composition has remained relatively unaltered. In low regions, scientists have observed "ponds" of bluish dust. It is speculated that they may have been lifted from beneath the surface by electrostatic forces, and flow like liquid into depressions. After a fly-by of asteroid Mathilde in 1997, Near-Shoemaker became the first spaceprobe to orbit an asteroid. Then, although it was not designed to land on Eros, it was commanded to touch down. Images were returned during its descent but ceased when the probe hit the surface. However, data continued to be returned from the gamma-ray spectrometer for several days, revealing the surface composition of Eros. 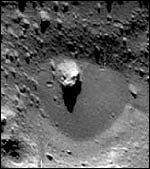 This seems to be awash with sediment, forming striking flat "ponds" within craters. It is also strewn with boulders, probably as a result of the recent formation, by impact, of an eight-kilometre- (five mile-) wide crater. The boulders, like so much of Eros's geomorphology, are a puzzle. It was once believed that the surfaces of asteroids would be clean, as any fragments from an impact would be ejected into space. Data from Near-Shoemaker show the opposite to be true. The distribution and size of boulders scattered on the asteroid's surface could give scientists a chance to find out what Eros is like below the surface. Simulations of an impact could be carried out to see what parameters (speed, mass of projectile, strength and density of Eros) would yield the observed distribution of boulders. Beneath the surface Eros may be a loose aggregation of boulders and dust, which would explain how it could absorb the energy of a large impact without breaking apart. Fractures seen on the surface may indicate that Eros has been internally riven by impacts. The bluish soils are a mystery. "Deposits with the properties seen on Eros have no obvious analogues in previous lunar or asteroid data," say scientists. Does our closest ever look at an asteroid help us if we ever have to deflect one from a collision course with Earth? "There is no telling how they would respond to more forceful poking and prodding than would be needed to divert them," says Erik Asphaug. Someday that will be a pertinent question. Over its lifetime, Eros has a 5% chance of colliding with the Earth, but fortunately not anytime soon. Then again, some other asteroid will have us in our sights before that. The research is published in several papers in the journal Nature.